This year is just flying by in a blur of lunchboxes and trying to come up with Easy School Lunch Ideas to keep those school lunches fresh and fun! Do you remember that feeling when we were kids and the days were so long. But now it’s like you blink and another month has passed. I think an exception to this is for those of us with young babies and tantruming toddlers. Now those days are loooooong. Did you know…so far this year you would have packed around 100 lunches for each child if they are in primary school? That is a lot of lunches. And we still have at least 100 more school lunches for each child to get us through the remainder of the school year. So what do you need? You need school lunch ideas. And LOOOTS of them. Preferably school lunch ideas that are quick and easy right? So here it is – blog post all about Easy School Lunch Ideas to help you out. And let’s face it, we all need a helping hand to stay enthused about lunchbox packing! 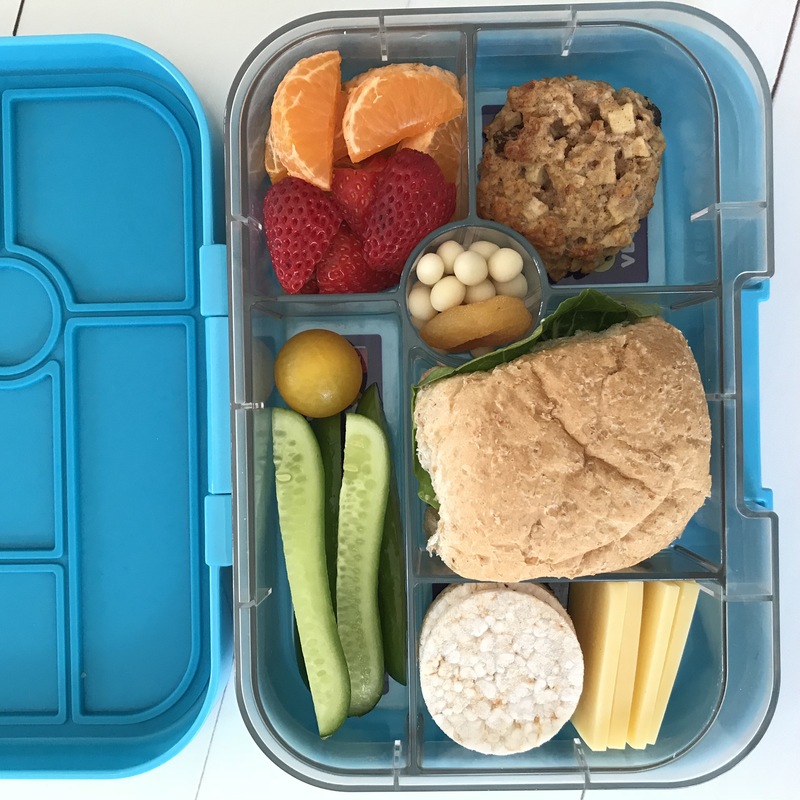 This blog post, Easy School Lunch Ideas contains affiliate codes and links. This means if you decide to purchase using these I will earn a small commission at no additional cost to you. Earlier this year I conducted a lunchbox packing challenge with a number of my lovely subscribers. And in this challenge I shared a lot of my favourite tips and tricks to make lunch packing that much easier. 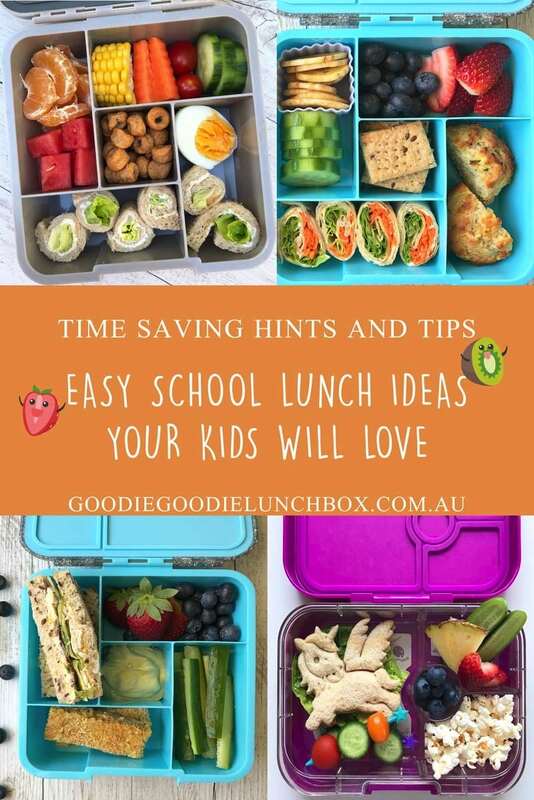 And I am going to also share them with you in this post about Easy School Lunch Ideas, because ultimately lunch packing needs to be easy and to do this it requires a little organisation. My first tip for packing school lunches is to plan your lunches. If you do not meal plan already, you NEED to. It saves you time and money. I find it easy to plan out my meals and lunchboxes for the week and at the same time I write out my grocery list. To make this easier for you I have this great Lunchbox Planner here so use this to plan out your lunchboxes. It includes sections to note what you need to bake in advance and what groceries you will need. If you have older children get them involved in this process and use this as an opportunity to get them involved in planning what they would like. Offering a selection and variety of foods in school lunches keeps lunchboxes fresh and fun. A way to keep motivated to do this is by planning your weekly lunchboxes. Do you love baking? You may have guessed that I probably do. I love it, the mixing, the delicious scent of baking goodies…the eating. Especially the eating. But some weekends, I really can’t be bothered. And I don’t really buy biscuits or other sweet baking. So I do need to keep on top of my baking. But I do NOT bake every week. Just most weeks 😉 but seriously it’s mainly because I am testing out new recipes. What I tend to do is bake multiple batches of baking in one day and freeze my goodies in ziplock plastic bags to use throughout the term. SIMPLE and really not much more effort than baking one batch. Frozen baked goods normally last 2-3 months so you can bake and freeze enough to last you the whole term. I have OODLES of recipe on my site for baking so – after you have finished reading this of course – go and check them out! Some of my favourite baking recipes are these Chocolate Chip Muffins with Zucchini which seem like an amazing treat food but actually have a lot of goodness in them. I call these a win win! I also really love these Carrot Oat Cookies and if you read this blog post it also talks about how to bake with your kids if this is something that you are not overly confident with this. Have I told you about my deep freeze? I love it. LUUURVE it. My big, boxy, amazing deep freeze. We got ours when I was pregnant with the twins as I wanted to make ahead a lot of meals for those newborn days. And I am so glad I did. It was INCREDIBLE. Looking back I really don’t know how I would have coped without it. And I still find it just as valuable today. Now I realise that not everyone has a deep freeze but most of us have a freezer so make it work for you. I have already spoken about baking ahead and freezing for school lunches but it is not just baking you can freeze. You can also freeze pre-made sandwiches, bread rolls and croissants and have this ready to pull out as needed. But just a note. Not all fillings freeze equally. Don’t go freezing lettuce you will end up with slimy green gunk. But ham and other deli meats tend to freeze well, as does with cheese. I normally spend time making some ham and cheese filled buns, sandwiches or croissants in bulk and then freeze them. To defrost, I get out what I need from the freezer the night before and allow to defrost in the fridge. In the morning I then fill with lettuce and tomato or other salad vegetables or just leaving as it is before popping it in the lunchbox. Just like the baking – these will also freeze well for 2-3 months. Making cheese and ham filled bread rolls in advance and freezing until needed is a great way to always have healthy options at your finger tips. Simply defrost overnight in the fridge and add salad options in the morning before packing in the lunchbox. I am pretty sure my teacher was talking about doing my homework when he was talking about preparation but I think you can also apply this to lunchbox packing. 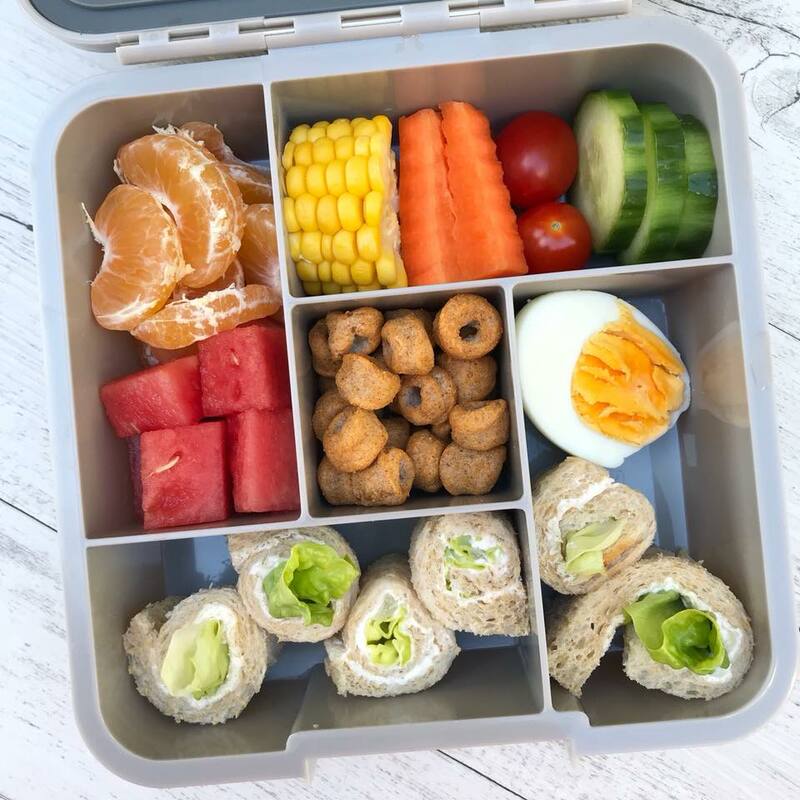 Other than baking and sandwiches you can also prepare fruit and vegetables and other snacks in advance and in bulk once or twice a week to make packing those lunchboxes even easier. Apples, sliced and soaked in salted water for 5 mins. Drain and rinse the apple slices and store in an airtight container covered with a moist paper towel. Store for 2-3 days. Carrot sticks, store in water (changing the water daily) or in wet paper towel or kitchen towel. Store around 5 days. Celery sticks, store wrapped tightly in aluminium foil. Stores for 1-2 weeks. Cheese, diced or sliced. Stack together and wrap in clingfilm and then zip-lock bag. It is important no air gets to the cheese or it will harden. As per use by dates. Corn Cobs, cooked, drained and stored in an airtight container. Store for 3-4 days. Cucumbers, cut into sticks or sliced covered in water or a soaked paper towel can be stored in an airtight container for up to one week. Pasta, plain and cooked stored in airtight containers lasts for around 3 days. Cover with a damp paper towel to stop the pasta from getting hard. You can rinse under cold water to freshen up before popping in the lunchbox. Popcorn, make in bulk and store in an airtight container. Store for up to a week (this is for natural unflavoured popcorn). Please note: that while I do store some of these foods like this, some preparation and storage ideas I have only read about and have not tested myself. So now you have learned some lunch packing tips let’s get on to some easy school lunch ideas! What can be more quintessential than a sandwich in the lunchbox? But who says you need the same sandwich every day? For the record, I am pretty sure I had exactly the same sandwich for most of my schooling days. So a really easy school lunch idea is to vary those fillings. I favour wholemeal and multigrain breads for school lunches for kids (and adults for that matter) to boost the fibre intake. I also like sneaking in protein or vegetables too to really boost the nutritional value. You can also continue to make sandwiches in different ways to bump up the fun factor. Using sandwich cutters or even cookie cutters take sandwiches to the next level. I adore the range of lunch cutters by The Lunch Punch and these puzzle cutters* (*affiliate link) are my favourite. There is a fantastic range of cutters from dinosaurs to unicorns and they do not take much additional time to use. Also another hack with this is not to put your spread close to the edges so that when you cut the crusts off using the cutter then you can freeze these for breadcrumbs. You can use my affiliate code GOODIE if you would like 10% off your order. One of my favourite ways to serve a sandwich in the lunchbox is sandwich sushi. And it’s an especially convenient way to serve sandwiches in bento boxes. It’s really easy and such a fun way to serve a sandwich. Watch my tutorial here. My favourite fillings are cream cheese and lettuce or cream cheese and ham. Also if you are a bento-style lunchbox lover sandwich sushi is a great hack to get a sandwich to fit into the compartments. Sandwich sushi is a fun Easy School Lunch Idea. Served along side fresh fruit and vegetables with a wholegrain savoury bite and a boiled egg this makes a balanced, colourful school lunch. Another fun way to serve a sandwich is on skewers like these fun Stix by The Lunch Punch* (*affiliate link). And if you love these Stix for sandwiches check out this blog post with LOOOTS of ideas for putting kid food on sticks. You can use my affiliate code GOODIE for a 10% discount if you wish to purchase these skewers. 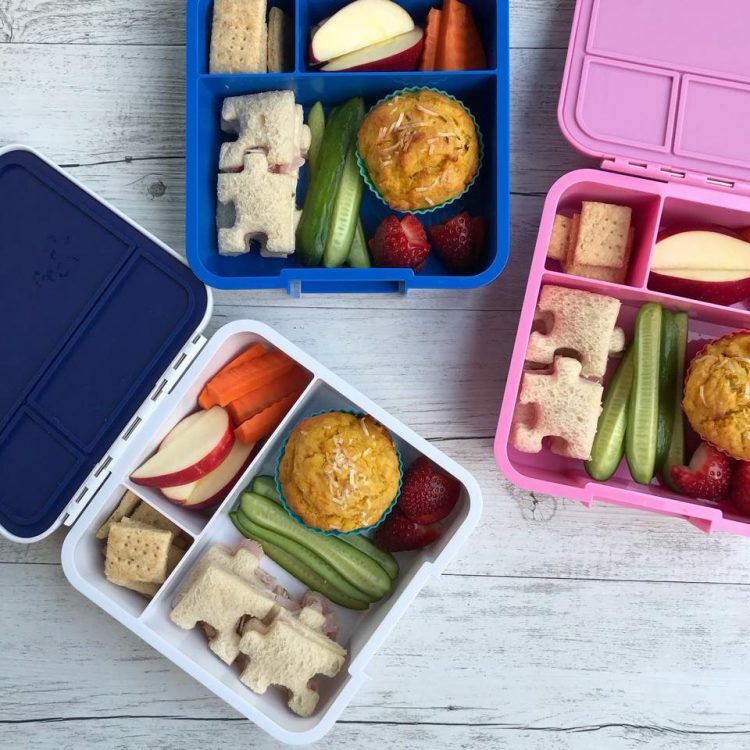 There are so many delicious ways to vary lunchboxes by packing ‘main’ items other than sandwiches. Wraps are something the kids have a lot in our house, so much so I actually have a whole blog post dedicated to wrap filling ideas for school lunches. 10 ideas in fact! You can check out the full bog post here. But wraps don’t have to be served in the traditional way. Why not cut into strips and toast in the oven or under the grill until they are crisp and serve in the lunchbox with a dip. Or use the tortilla as a base for quiches. Check out this blog post for more ideas for Quick and Easy Lunchbox Quiches. I think it is tough as a parent these days coming up against a lot of advertising and marketing of packaged foods aimed at kids. Unfortunately a lot of these food items are high in salt and sugar and these one are not really great for lunchboxes. 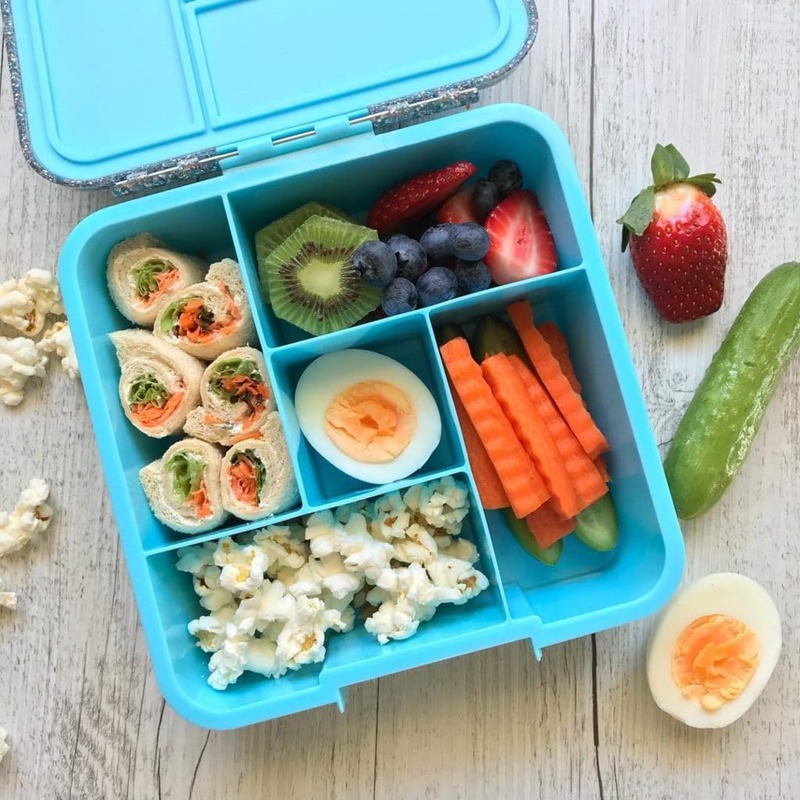 I do think there is a place for packaged foods (and I do include these options in our lunchboxes) and some options are completely fine for lunchboxes and I like you will use packaged foods at home and in the lunchbox from time to time. But I do try to limit packaged foods and will avoid items that are high in sugar. Especially for lunchboxes. I favour home baking for lunchboxes as a lower sugar option for the lunchbox. Generally all my baking recipes on my site are (generally) low in sugar. And not only that they really taste great. Some of my baking recipes are even completely free of any added sugar and they are sweetened only with fruit. And this means they are perfect for school lunches! These Sugar Free Apple Oat Cookies are really delicious, super easy to make and are devoured in this house – so double the recipe! I love these Sugar Free Carrot Cake Muffins for school lunches and I also adore them for myself for breakfast. A really great way to make food fun is with cookie cutters and skewers like Stix. It’s not just sandwiches that can benefit from some fun shapes, cut cheese or vegetables with cookie cutters to make these look fun for little eyes. I have already written about these fun Stix by The Lunch Punch* (*affiliate link) which are great for threading pancakes, fruit, cheese, veggies and more! Check out this blog post for more ideas. Remember my affiliate code GOODIE will give you a 10% discount at The Lunch Punch. 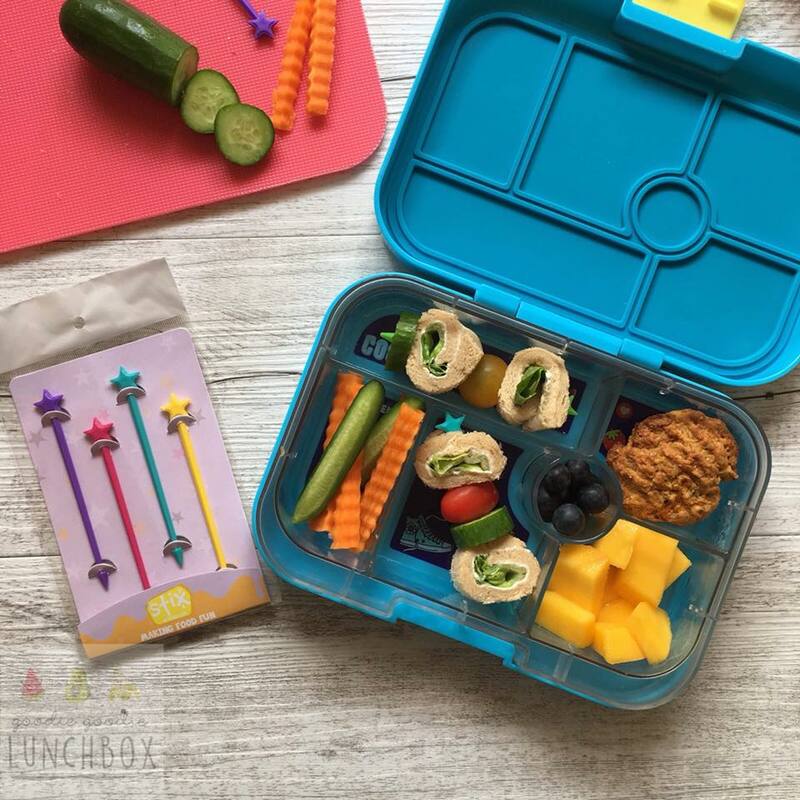 And finally my top tip is packing lots of fruit and vegetables, not only because they are so good for us, but they also make lunchboxes look so colourful! #tastetherainbow. I hope this post Easy School Lunch Ideas has been valuable for you! I know it was very long post so thank you for reading. One thing I wanted to share with you that I have said before but I think it is important to remind ourselves again: don’t judge success based on what does or does not come home in your kids lunchbox. 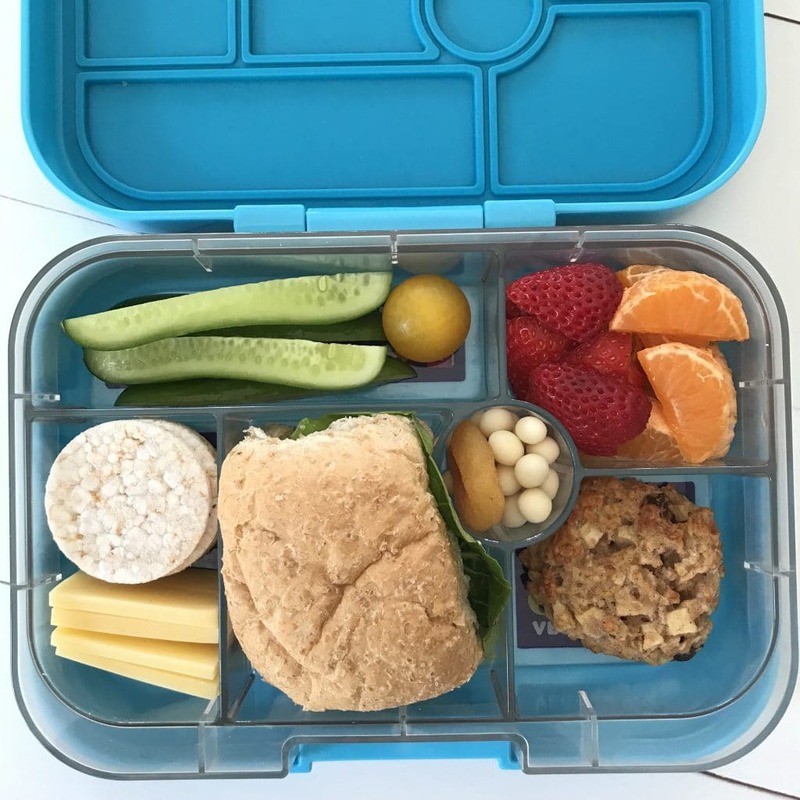 The fact you are offering healthy food choices in your kids’ lunchboxes is the success.